halloween was an extremely festive one this year. the weekend before nicolaus and i dressed up as a hot dog and mustard (nick chose the costumes this year ;) for grace and jean's annual costume party. then on hallween eve, nicolaus and i went on the haunted ski lift at sundance with some friends. which i didn't even know was a thing! but it is. and it's a real good time.and on halloween, i learned that skullcandy goes all out for the holiday. 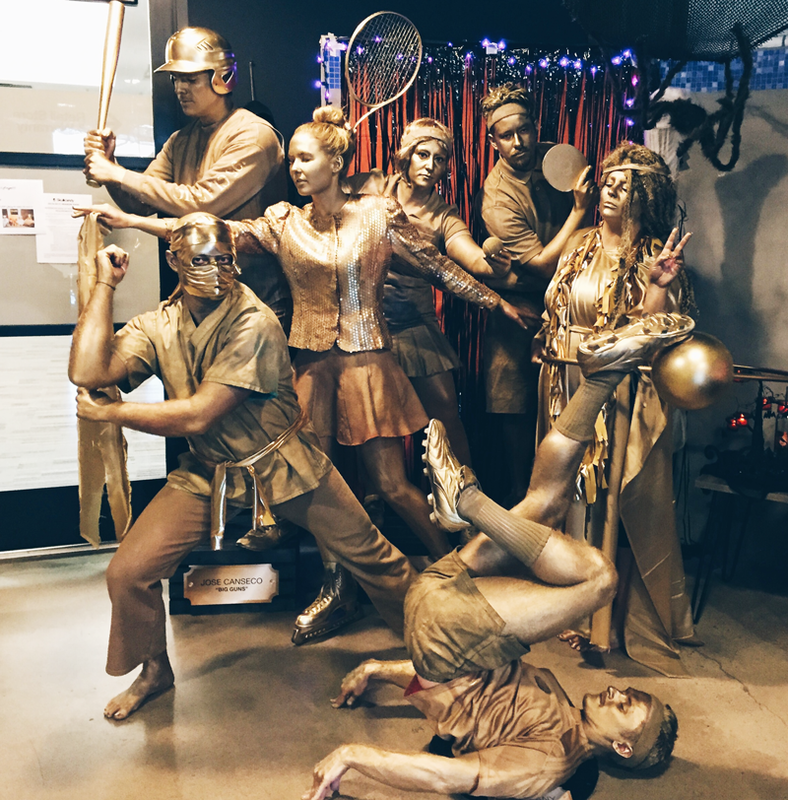 the art team dressed up as trophies, decked out in full body paint, spray painted attire, and stands with plaques. we even went and panhandled outside of smith's for about 15 minutes and drew in quite the crowd, and made $25! haha it quite the experience. plus it was fun at the company party that afternoon to see everyone else's costumes. definitely worth the EIGHT blisters i got from walking around all day in ice skates. but i can't complain, because no ankles were twisted! #winand after much scrubbing and exfoliating, i was able to clean off and change into my mustard costume and nick got into his hot dog costume before heading over to my cousin's house to hang out for a bit, eat lots of candy and watch hocus pocus. it really was a good time and i enjoyed every minute of it. even the thirty that i fell asleep for in the middle of it :)hope everyone had a fun and sugar-filled halloween!! UNREAL!! Such a cool costume idea. wow! how amazing! great idea! This costume is unreal, I love it!! this costume is genius! & i love that you guys watched hocus pocus. i feel like it's a halloween must.